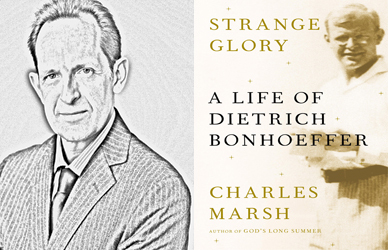 For Christmas, my wife kindly gave me a copy of Charles Marsh’s excellent new biography, Strange Glory: A Life of Dietrich Bonhoeffer. I flew through the 500+ tome in less than 10 days thanks to Marsh’s inviting writing style. Several good Bonhoeffer bios are available, but Marsh wanted to capture the person of Bonhoeffer in all his humanness – his style, his passions, his idiosyncrasies. For example, you get a taste for how Bonhoeffer was infatuated with fashion (including shoes) and music. He was also a very critical person, always analyzing and taking things apart with his mind (movies, concerts, books, even people). This bio definitely painted a realistic portrait of a complex person – yes a hero, yes a genius, yes an inspiring pastor-theologian, but strange like any other human is strange. Marsh helped remind me why I love Bonhoeffer – he is one of my favorite theologians/pastors. #1: Bonhoeffer was an ecumenist – yes, he was bred on Luther, but he had enough Reformed Barthianism to trouble this, and he learned much about black church tradition while in the US, and he had a peculiar fondness for Catholic spirituality and liturgy (while maintaining a disgust of anything that smacks of dogmatism and ritualism – so he writes in his diary). He was, actually, quite unusual for being so open to sharing life and finding the good in other Christian traditions. #2: Bonhoeffer did not feel completely comfortable in the academy or the church. His was bored with the academy (and never took up a normal faculty position, he was a perpetual adjunct until his teaching rights were refused). He was also a bit of an odd duck in the seminary and church (though seemed to be well liked overall). I feel that ways sometimes, uncomfortable in the pew (sometimes), but also at the academic conference (too often). #3: Bonhoeffer loved to travel and experience new cultures. He loved Italy especially, but also drove all over the US and into Mexico and beyond. It was partly because his experience in Harlem and in the US south that he was so forward thinking about racial issues in Germany after his US time. #4: Bonhoeffer was neither “liberal” nor “conservative.” He had studied under Harnack and a Liberal Protestant faculty at Berlin, but also ended up fitting into the label of Neo-Orthodox and enchanted with Barth (to the chagrin of Harnack!). Still, he never turned his back on his teachers. He tried to take the best of both these worlds of his. #5: Bonhoeffer failed at quite a number of things (and so do I). He had many troubles in ministry, and his seminary work (Finkenwalde) did not “hit home” with many of his students. Certainly some folks did appreciate him, but he struggled throughout his short life with connecting with his audiences. But he was so creative and energetic. He was honest about his failures, self-aware. But never lost hope or gave up. #6: Bonhoeffer walked a fine line of dealing with wealth. He came from a very wealthy family and took many opportunities to cash out (often literally) on it – clothes, traveling, a fancy car, food/drink, gifts for others. He took no vow of poverty! But when it counts, he knew how to give it up or share. Because of the status of some of his relatives, when he went to prison he was given some perks – a better room with a good view, better and more food, etc. He refused the special food because he knew he didn’t deserve better than the other inmates and didn’t want to take food away from them. He would mail out encouragement notes that would be smuggled back in to encourage other prisoners. He was “spoiled” with money, but he wasn’t “spoiled” by money. When he wrote his will (in prison), he seemed very happy giving away his belongings and imagining others enjoying them. #7: The Gospel is about Redeeming People through Jesus Christ – many people around Bonhoeffer thought he was nuts for obsessing over “the Jewish question” (many Christians, I should add). But Bonhoeffer was in a league of his own by being singularly focused on fighting the evil around him to realize a redemptive vision of the gospel of Jesus Christ. #8: Bonhoeffer treated Scripture as living and active. Read his sermons. Read his letters. Read his books. He read Scripture often – many people do. But he also read Scripture as a message alive for today. Not many people do that. Scripture would speak to Bonhoeffer, because he was attentively listening. I used to take this for proof-texting, but Bonhoeffer was tuned into the frequency of Scripture, the voice of God, in a way I rarely see (I think Eugene Peterson fits as well). But it did not fill him with pride. He was honest (in his prison letters to his friend) that he struggled with reading the Bible very much then. Anyway, I absolutely loved this biography, even though it busted my hagiographic bubble of Bonhoeffer as a one-dimensional saint. Now more than ever, though, I wish I could have met him. Perhaps that is a testament to Marsh’s great achievement. Go buy this bio if you are interested in Bonhoeffer. Thanks. I enjoyed your review. I love Bonhoeffer for all the same reasons, but most of all because he lived a truly human life. He was fully engaged in life as he followed Christ. I appreciate your insights. Thank you.